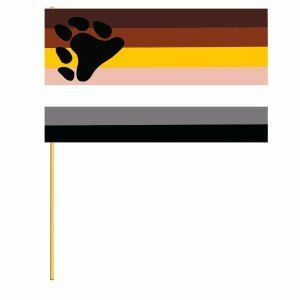 Bear Pride Flag on Stick 4" x 6"
Home > Gay Pride Gay Gift Items > Gay Pride Flags and Bunting > Bear Pride Flag on Stick 4" x 6"
Silk screen bear pride flag on stick. 4" x 6"
Note: Does not fit on stand used with stick rainbow flag. No stand is available for this flag.